With the plaster backing done for the rubber positive I made yesterday, I removed the assembly from the rubber mold. 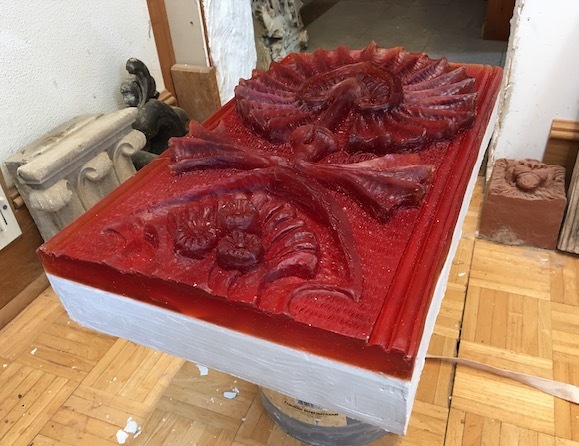 Once the plaster backing on this master positive is soaped up well, I can make the plaster piece-mold of this for pressing the terracotta into, The piece mold will be made in at least 5 pieces, most likely about 8 pieces. It won’t happen very soon as I used up the very last bag of pottery plaster I had on hand and I’ll have to order more along with some other materials and I need some more clay, but I don’t want to order clay when it’s below freezing, so I may order the clay in the spring and order the plaster and other stuff I need now- soon! I’ve begun the process last night to take my design towards making it in hand-pressed kiln fired terracotta, that requires two additional mold making steps, the first of which is making a rubber positive master cast using the new rubber mold, the second step is making a plaster piece-mold taken off the rubber positive. Shown below is the rubber positive that was poured in last night- the remaining cavity not filled with that amber colored rubber will be filled with plaster to save on expensive rubber since only the face is the important portion of the design. 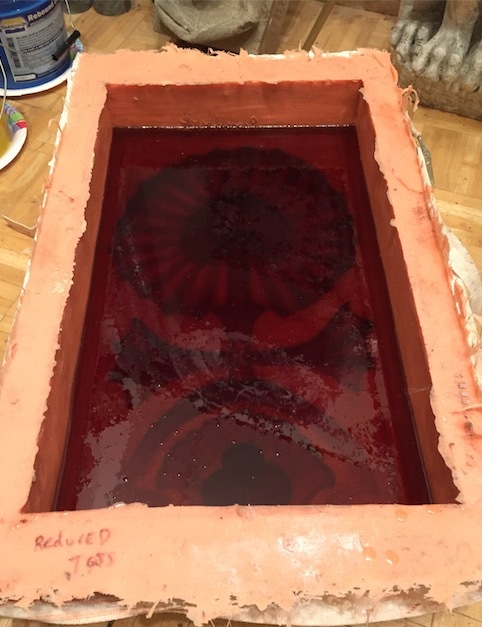 The amount of rubber shown in the mold was 2 gallons total, and this cost just about $200, so it’s easy to see how much it would cost to fill this the rest of the way up with this rubber! Once this rubber is cured and the cavity filled to the top with plaster, it’s taken apart and the plaster and rubber master positive can be used to make the plaster piece mold. This is similar to the way this was done for the originals my work is based on, though the final plaster piece molds are made identically to the way they were for these pieces back in the 19th and early 20th century when these ornaments were used on building facades. All of the Sullivan/Elmslie designed terracotta ornaments were made exactly the way I make them- hand-pressed clay into plaster piece-molds, and then final finishing and detailing all done by hand one at a time.